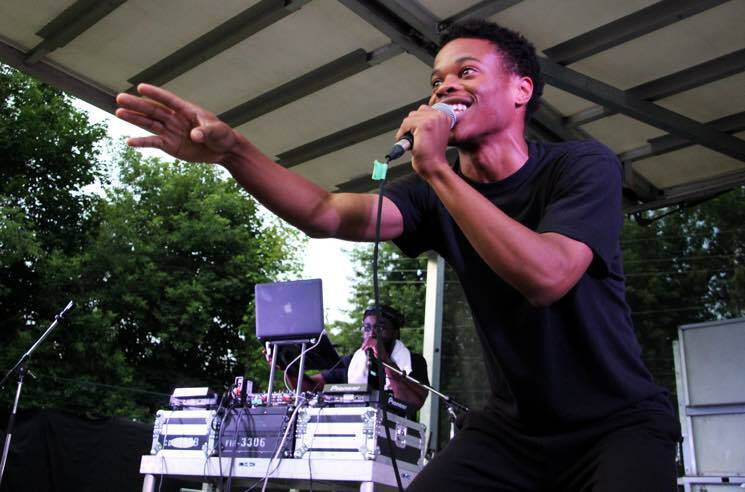 Tucked away in a wooded corner of Bissell Park, Mississauga's John River, his DJ and hype man were more than ready to show the Riverfest crowd why the 21-year-old is one of the brightest young musical stars to emerge from his city. With the early evening set, it took a while for him to truly shine. River's penchant for preaching love and positivity was undoubtedly genuine as he encouraged the audience to say "I love you, I need you, you look so good" to one another, though further attempts to get them involved with call-and-response chants and singing along to Sam Smith's "Stay With Me" soon became repetitive and forced. Furthermore, the urgency in River's lyrics and raspy delivery that came to the forefront with "The Backup Plan" were stunted slightly by his hype man, whose shouting left little room for his MC's verses to resonate with the crowd. To right the ship, River went a cappella to deliver a powerful piece of spoken word called "How to Be a Man," dedicated to getting black youth involved in his own community. The crowd hung on to his every word from that point forward, blown away by closer "Hope City" which saw River push his flow to an incredibly high speed without missing a word. John River Returns with New Single "Burn the Boats"